Yes, you're seeing it right, today's manicure features flowers. I know, totally out of character. Although...didn't I just post a floral design yesterday? Ok, so maybe I did but don't judge me, I didn't have a choice! I really didn't have much time last night to paint my nails so for that extra oomph I added water decals. These are from Nicole Diary (number 08*) and I am hoping to feature a few different designs by the time this challenge is over. The thing I notice with these straight away was that they had to be submerged in water for a bit longer for the backing paper to come off. Other than that they were durable and didn't have that 'plastic' or 'tissue paper' feel. Those often rip when I try to adjust them on my nails. 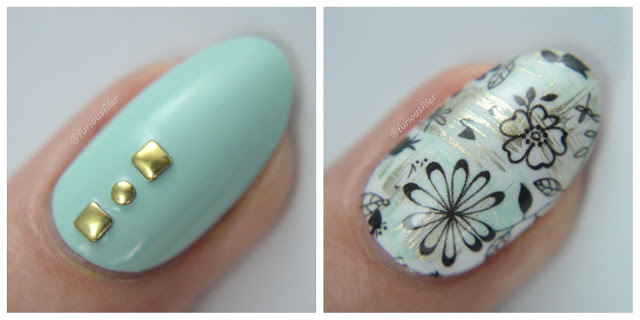 The decals feature a delicate floral pattern on 2 strips of paper as opposed to an individual piece for each nail, so you can choose whatever part of the design you like. Love the florals and the studs are so stylish.